Following the awful events in Manchester on Monday evening emotions are, understandably, running high. Sadly the same cannot be said for thought processes – although this hardly uncommon even when 22 men, women and children haven’t been brutally slain by a religious fanatic. Ignoring the usual twaddle about false flags and the like which always surface after an event like this, those who are thinking with their hearts rather than their brains have come out with the usual selection of bright ideas about where we go from here. Whilst I don’t myself know how to tackle this issue sensibly (Tom and Pete offer different suggestions), it’s rather easier to spot the less sensible suggestions such as those mentioned below. One of the things which most enrages people after an event such Manchester is how it turns out that the perpetrator was known to the authorities all along. This is taken to mean that they knew he (or she) was a mass murdering wannabe and therefore should have been under 24/7 surveillance, if not already rotting in a gaol cell. It should come as no surprise (but will) to learn that being known to the authorities can mean anything from knowing someone who knows someone who is considered a higher risk to being a low-level petty crook through to being someone who went to Libya on a family holiday. The number of people on the UK’s terrorism watch list is, at present, in the region of 3,500 people. The Police and the Security Service simply do not have the manpower to keep that number of people under physical surveillance on a 24/7 basis. Contrary to what is shown on screen, whether big or small, keeping tabs on a single person takes more than a couple of coppers hiding behind a newspaper in an unmarked car. For something more realistic think 3 teams of multiple people operating in 8 hour shifts. Once things like illness and holidays are factored in, physical surveillance of a single person can easily require two dozen people. 24 people for each of the 3,500 potential terrorists would require 84,000 bodies – and that’s before you factor in all of the analysts and other office types who occupy that building on Millbank. That figure is, very roughly, an order of magnitude above the numbers currently employed by MI5 and about two-thirds of the number of police officers across England and Wales. Full time surveillance of each and every potential suspect there is impossible without a lot of new people (who’ll require training) and the money to pay them (unless you’re using figures suggested by Diane Abbott). The other problem which must be considered here is that in the vast majority of cases the ethnicity of those on the watch list is likely to be other than caucasian and that they will live in areas which are not predominantly occupied by melanin deficient types such as the author. Thus, in order for your surveillance teams not to stand out like a black man at a KKK rally, you’ll need to recruit people with similar skin tones who can fit in to the local communities without too much suspicion. 84,000 people from approximately 3 million UK muslims? Good luck with that. This is why the Security Service grades those on the watch list by potential risk and focuses most of its efforts on those deemed to be most risky. Mistakes will, of course, be made and, if press reports about the suicidal criminal involved in Monday’s attack are accurate, incompetence can also not be ruled out. It will be interesting to see what the internal investigation (should we get to read any of it) has to say in this case. Another favourite idea is to round-up all of those on the watch list and put them in a camp somewhere. Where that somewhere might be is conveniently not mentioned (unless you’re Tommy Robinson in which case you think sending them to the far side of the world is a sensible suggestion). The UK hasn’t used internment camps in over 40 years, having last tried them in NI during the troubles with rather limited success and over the course of that particular iteration less than 2,000 people were interned. 3,500 people is a lot of people to put somewhere – or, more realistically, various somewheres since even the UK’s largest gaol (Wandsworth, since you ask) only has space for about 1,800 souls. Given how difficult it is to build new housing in this country, building 10 or 20 new sites to house that many people is not going to happen quickly. Does the State, one of the biggest land owners in the country, have the necessary amount of (now unused) land which could be repurposed in a shorter space of time? This discussion of where to put all these is people though is somewhat secondary. 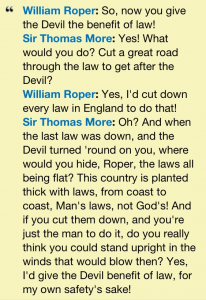 Short of taking a scythe to the law of the land (to the applause, no doubt, of William Roper) such measures would be thrown out by the judiciary in short order should they somehow manage to pass through parliament. If surveillance and internment won’t work, surely offshoring (to borrow a phrase) the problem would work? As with internment this idea runs in to the twin problems of legality and location. If, like the person responsible for the attack in Manchester, they are a British national with no other nationality to their name then there is no country of origin to send them to and the Geneva Convention of 1961 (of which the UK is a signatory) precludes rendering someone stateless. For those who aren’t British nationals or who have dual nationality then the system would at least know where to send them, subject to proving in a court of law that their deportation is justified. Since the security services will not disclose what information they have on such people to an open court it is rather unlikely that this will happen. As I said in my introduction, I don’t have any answers as to how to solve this particular problem. There are somethings which could help (an Islamic reformation; weaning ourselves off of our dependence on Saudi Arabian oil; stability, rule of law and economic growth in places like Libya, Pakistan and Afghanistan) but those are long-term strategic goals rather than immediate tactical objectives. You are not making yourself unpopular with me. The “something must be done” anger that follows a mass murder like this is dangerous and rational voices need to be heard. There’s nothing wrong with being angry after an event such as this but getting angry doesn’t, in and of itself, solve anything. Yes, something or, more likely, many somethings have to be done but, as ever, the simplistic and impractical (but comforting) ideas are the ones which gain traction amongst those who either don’t know any better or who are letting their emotions rule them. I have tried to suggest some practical measures over at my blog and it’s stimulating an interesting discussion. Also interesting was the young Muslim lady on Question Time this week who went further than my suggestion of blocking Saudi funding of Wahhabi Mosques. She actually said they should be closed down. It’s distressing to see so much confirmation bias in the angry discussions. Those who think all Muslims are terrorists (fewer than five percent of British Muslims support jihadist terror) are confirmed in their views by the bombing. Those who think everyone calling for action to be taken to integrate Muslim communities more effectively is an Islamophobe are even more convinced they are right. The present terror campaign is far less professional and deadly than that of the IRA was. Casualties are lower and yet the demands for extreme “action” one way or another are more intense. Every mass murder seems to lead to calls to suppress the very freedoms we are defending, whereas the best way to handle such crimes is to treat them like any other. We shouldn’t dignify common criminals by treating them as special or passing new legislation in response to them. I liked President Trump’s approach of calling them “losers”. I just call them mass murderers. 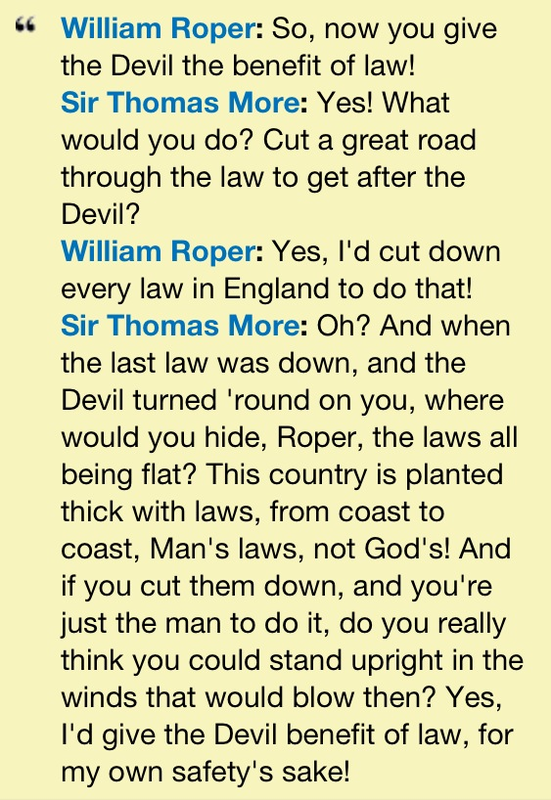 What that guy did in Manchester was a crime under the Common Law before any Act of Parliament was ever passed. It’s a police matter and the only pressure on politicians right now should be to ensure the police, Special Branch and MI5 have the resources they need. Tagging has been suggested, as it does not require individual manpower – many may be monitored and flagged automatically if they leave their permitted zones. But of course this is a big civil liberty issue, as the majority of those under surveillance have not broken any law which would allow or justify tagging.